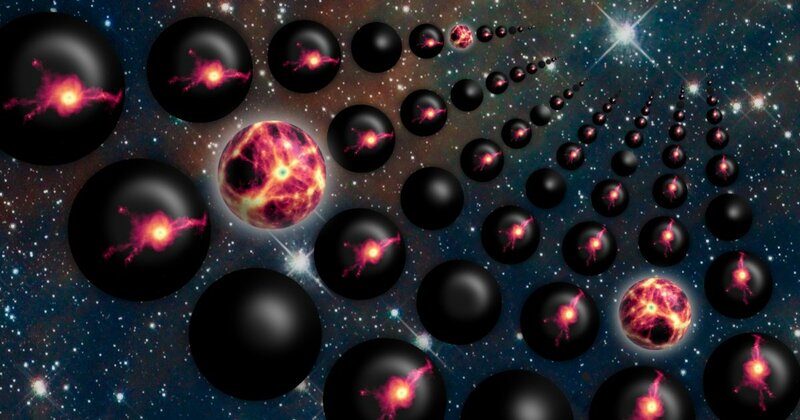 The Multiverse Theory, which states that there may be multiple or even an infinite number of Universes, is a time-honored concept in cosmology and theoretical physics. While the term goes back to the late 19th century, the scientific basis of this theory arose from quantum physics and the study of cosmological forces like black holes, singularities, and problems arising out of the Big Bang Theory. One of the most burning questions when it comes to this theory is whether or not life could exist in multiple Universes. If indeed the laws of physics change from one Universe to the next, what could this mean for life itself? According to a new series of studies by a team of international researchers, it is possible that life could be common throughout the Multiverse (if it actually exists). The studies, titled “The impact of dark energy on galaxy formation. What does the future of our Universe hold?” and “Galaxy formation efficiency and the multiverse explanation of the cosmological constant with EAGLE simulations“, recently appeared in the Monthly Notices of the Royal Astronomical Society. The former study was led by Jaime Salcido, a postgraduate student at Durham University’s Institute for Computational Cosmology. The latter was led by Luke Barnes, a John Templeton Research Fellow at the University of Sydney’s Sydney Institute for Astronomy. 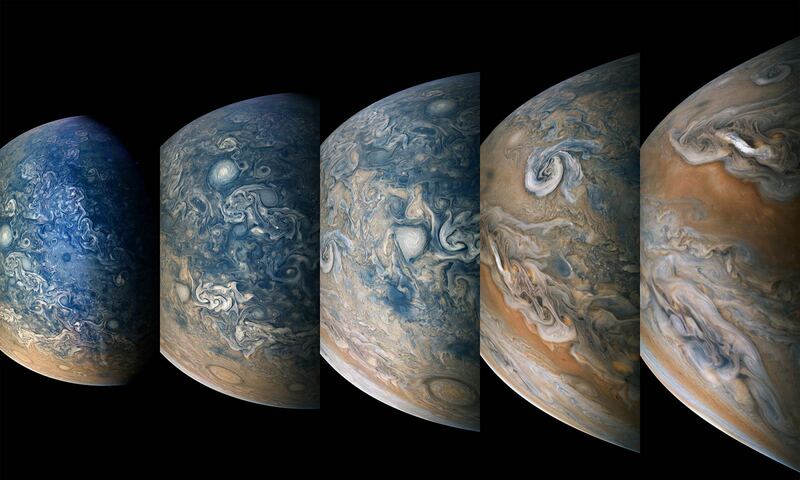 Both teams included members from the University of Western Australia’s International Center for Radio Astronomy Research, the Liverpool John Moores University’s Astrophysics Research Institute, and Leiden University’s Leiden Observatory. Together, the research team sought to determine how the accelerated expansion of the cosmos could have effected the rate of star and galaxy formation in our Universe. This accelerate rate of expansion, which is an integral part of the Lambda-Cold Dark Matter (Lambda-CDM) model of cosmology, arose out of problems posed by Einstein’s Theory of General Relativity. As a consequence of Einstein’s field equations, physicist’s understood that the Universe would either be in a state of expansion or contraction since the Big Bang. In 1919, Einstein responded by proposing the “Cosmological Constant” (represented by Lambda), which was a force that “held back” the effects of gravity and thus ensured that the Universe was static and unchanging. Shortly thereafter, Einstein retracted this proposal when Edwin Hubble revealed (based on redshift measurements of other galaxies) that the Universe was indeed in a state of expansion. Einstein apparently went as far as to declare the Cosmological Constant “the biggest blunder” of his career as a result. However, research into cosmological expansion during the late 1990s caused his theory to be reevaluated. In short, ongoing studies of the large-scale Universe revealed that during the past 5 billion years, cosmic expansion has accelerated. As such, astronomers began to hypothesize the existence of a mysterious, invisible force that was driving this acceleration. Popularly known as “Dark Energy”, this force is also referred to as the Cosmological Constant (CC) since it is responsible for counter-effecting the effects of gravity. Since that time, astrophysicists and cosmologists have sought to understand how Dark Energy could have effected cosmic evolution. This is an issue since our current cosmological models predict that there must be more Dark Energy in our Universe than has been observed. However, accounting for larger amounts of Dark Energy would cause such a rapid expansion that it would dilute matter before any stars, planets or life could form. For the first study, Salcido and the team therefore sought to determine how the presence of more Dark Energy could effect the rate of star formation in our Universe. To do this, they conducted hydrodynamical simulations using the EAGLE (Evolution and Assembly of GaLaxies and their Environments) project – one of the most realistic simulations of the observed Universe. Using these simulations, the team considered the effects that Dark Energy (at its observed value) would have on star formation over the past 13.8 billion years, and an additional 13.8 billion years into the future. From this, the team developed a simple analytic model that indicated that Dark Energy – despite the difference in the rate of cosmic expansion – would have a negligible impact on star formation in the Universe. For the second study, the team used the same simulation from the EAGLE collaboration to investigate the effect of varying degrees of the CC on the formation on galaxies and stars. This consisted of simulating Universes that had Lambda values ranging from 0 to 300 times the current value observed in our Universe. However, since the Universe’s rate of star formation peaked at around 3.5 billion years before the onset of accelerating expansion (ca. 8.5 billion years ago and 5.3 billion years after the Big Bang), increases in the CC had only a small effect on the rate of star formation. However, the team’s studies also cast doubt on the ability of Multiverse Theory to explain the observed value of Dark Energy in our Universe. According to their research, if we do live in a Multiverse, we would be observing as much as 50 times more Dark Energy than what we are. Although their results do not rule out the possibility of the Multiverse, the tiny amount of Dark Energy we’ve observed would be better explained by the presence of a as-yet undiscovered law of nature. These studies are timely since they come on the heels of Stephen Hawking’s final theory, which cast doubt on the existence of the Multiverse and proposed a finite and reasonably smooth Universe instead. Basically, all three studies indicate that the debate about whether or not we live in a Multiverse and the role of Dark Energy in cosmic evolution is far from over. But we can look forward to next-generation missions providing some helpful clues in the future. These include the James Webb Space Telescope (JWST), the Wide Field Infrared Survey Telescope (WFIRST), and ground-based observatories like the Square Kilometer Array (SKA). In addition to studying exoplanets and objects in our Solar System, these mission will be dedicated to studying how the first stars and galaxies formed and determining the role played by Dark Energy. What’s more, all of these missions are expected to be gathering their first light sometime in the 2020s. So stay tuned, because more information – with cosmological implications – will be arriving in just a few years time! When it comes to accuracy, everyone strives for a hundred percent, but measuring cosmic distances leaves a bit more to chance. Just days ago, researchers from the Baryon Oscillation Spectroscopic Survey (BOSS) announced to the world that they have been able to measure the distance to galaxies located more than six billion light-years away to a confidence level of just one percent. If this announcement doesn’t seem exciting, then think on what it means to other studies. These new measurements give a parameter to the properties of the ubiquitous “dark energy” – the source of universal expansion. The research team’s findings were presented at the meeting of the American Astronomical Society by Harvard University astronomer Daniel Eisenstein, the director of the Sloan Digital Sky Survey III (SDSS-III), the worldwide organization which includes BOSS. They are detailed in a series of articles submitted to journals by the BOSS collaboration last month, all of which are now available as online preprints. When it comes to measuring distances in space, astronomers have employed many methods. To measure distances to planets has been accomplished using radar, but it has its constraints and going further into space means a less direct method. Even though they have been proved to be amazingly accurate, there is still an uncertainty factor involved – one that is expressed as a percentage. For example, if you were to measure the distance from an object 200 miles away to within a true value of 2 miles, then you have measured with an accuracy of 1%. Cosmically speaking, just a few hundred stars and a handful of star clusters are actually close enough to have their distances so accurately predicted. They reside within the Milky Way and are just a few thousand light-years away. BOSS takes it to the extreme… its measurements go well beyond our galactic boundaries, more than a million times further, and maps the Universe with unparalleled accuracy. Just how is it done? To achieve a one-percent measurement at six billion light years isn’t as easy as measuring a solar system object, or even one contained within our galaxy. That’s where the BOSS comes into play. It’s the largest of the four projects that make up the Sloan Digital Sky Survey III (SDSS-III), and was built to take advantage of this technique: measuring the so-called “baryon acoustic oscillations” (BAOs), subtle periodic ripples in the distribution of galaxies in the cosmos. These ripples are the signature of pressure waves which once cruised the early Universe at a time when things were so hot and dense that photons marched along with baryons – the stuff which creates the nuclei of atoms. Since the size of the ripple is known, that size can now be measured by mapping galaxies. “With these galaxy measurements, nature has given us a beautiful ruler,” said Ashley Ross, an astronomer from the University of Portsmouth. “The ruler happens to be half a billion light-years long, so we can use it to measure distances precisely, even from very far away. Using its specialized instrumentation which can make detailed measurements of a thousand galaxies at a time, BOSS took on a huge challenge – mapping the location of more than a million galaxies. “On a clear night when everything goes perfectly, we can add more than 8000 galaxies and quasars to the map,” said Kaike Pan, who leads the team of observers at the SDSS-III’s Sloan Foundation 2.5-meter Telescope at Apache Point Observatory in New Mexico. Although the BOSS research team presented its early galaxy maps and beginning BAO measurements a year ago, this new data covers twice as much territory and gives an even more accurate measurement – including those to nearby galaxies. “Making these measurements at two different distances allows us to see how the expansion of the universe has changed over time, which will help us understand why it is accelerating,” explained University of Portsmouth astronomer Rita Tojeiro, who co-chairs the BOSS galaxy clustering working group along with Jeremy Tinker of New York University. Original Story Source: Sloan Digital Sky Survey III News Release. For further reading: Max Planck Institute News Release. In order to allow for a static Universe, Albert Einstein introduced the concept of the Cosmological Constant Lambda to make the math work out. Once it was discovered that the Universe was actually expanding, he threw the number out calling it his “biggest blunder.” But thanks to dark energy, the Cosmological Constant is back. “Cosmological Constant” on the Astronomy Cast website, with shownotes and transcript. [/caption]Much of what is known today about the birth of the cosmos comes from astronomical observations at high redshifts. Due to the accelerated expansion of the Universe, however, astronomers of the future will be unable to use the same methods. In a trillion years or so, our own Milky Way galaxy will have merged with the Andromeda galaxy, creating a new galaxy that has been quaintly termed “Milkomeda.” All of our other galactic neighbors will have long disappeared beyond our cosmological horizon. Even the CMB will have been stretched into invisibility. So how will future Milkomedans study cosmology? How will they figure out where the Universe came from? According to a paper published by the Harvard-Smithsonan Center for Astrophysics, these astronomers will be able to decode the secrets of the cosmos by studying stellar runaways from their own galaxy: so-called hypervelocity stars (HVSs). HVSs originate in binary or triple-star systems that wander just a hair too close to their galaxy’s central supermassive black hole. Astronomers believe that one star from the system is captured by the black hole, while the others are sent careening out of the galaxy at colossally high speeds. HVS ejections occur relatively rarely (approximately once every 10,000-100,000 years) and should continue to occur for trillions of years, given the large density of stars in the galactic center. So how would HVSs help future astronomers study the origins of the Universe? First, these scientists would have to locate an ejected star beyond the gravitational boundary of Milkomeda. Once beyond this boundary (after about 2 billion years of travel), the acceleration of a HVS could be attributed entirely to the Hubble flow. With advanced technology, future astronomers could use the Doppler shift of its spectral lines and thus deduce Einstein’s cosmological constant and the acceleration of the Universe at large. Next, scientists could use mathematical models of galaxy formation and collapse to determine the Universe’s mass density and age at the time that Milkomeda formed. 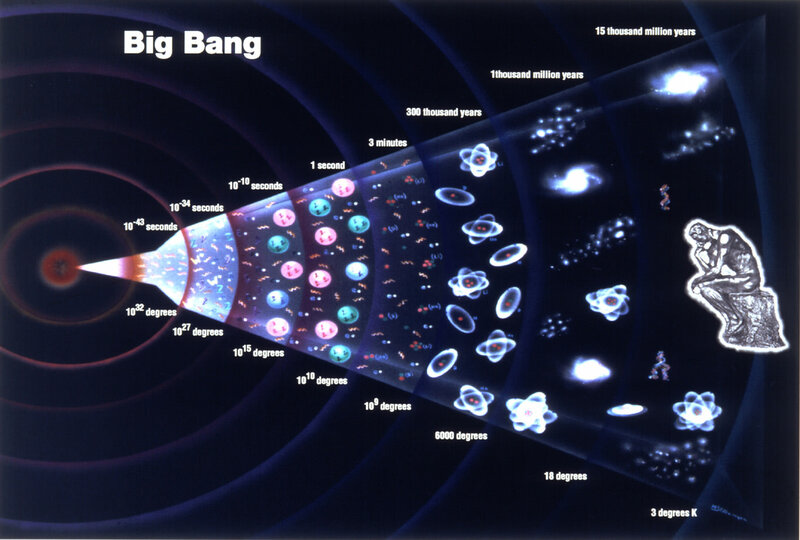 From their knowledge of the galaxy’s age, they would be able to tell when the Big Bang occurred.